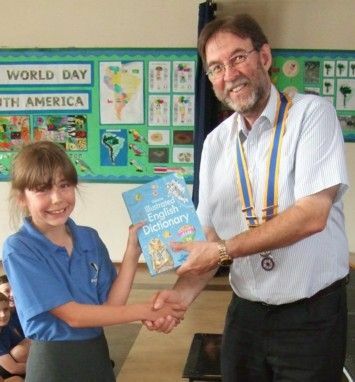 Cranleigh Rotary has continued its long-term support for local infant and junior schools as part of the Rotary Literacy Programme - an effort to help schools and promote educational excellence in the Cranleigh and Ewhurst area. Each year, the Club offers to provide year 4 students with copies of Usborne's Illustrated English Dictionaries, which are beautifully presented with over 1,000 illustrations. As an alternative, the Club offers £100 towards purchasing books for the school libraries. The type of support is decided after consultation with teaching staff, in order to best meet each school's needs. 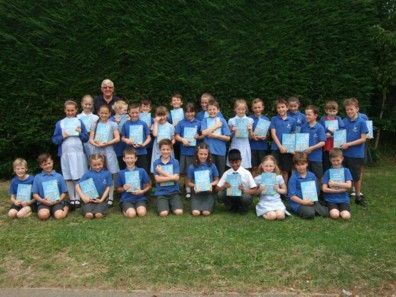 This year, Park Mead Primary School requested 64 dictionaries These were presented to year 4 pupils by Cranleigh Rotary's new President, David Hall, on Tuesday, 4th July. Each dictionary was labelled with the pupil's name and included a Rotary sticker. Cuthbert Mayne Primary School, Ewhurst Church of England Infant School and Cranleigh Church of England Primary School all chose to receive £100 to purchase books for their libraries. "We are delighted to be able to inspire and help young students in the local area once again," said David. 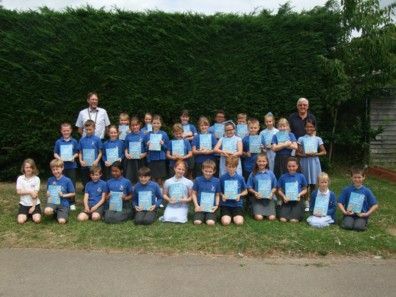 "The enthusiastic reactions of the pupils when they received their dictionaries shows how much they will treasure them and use them in their studies."